Check out Tobi's Emma Sueded Knit Bodysuit Introducing the softest bodysuit you gotta feel to believe, the Emma Wine Suede Bodysuit. 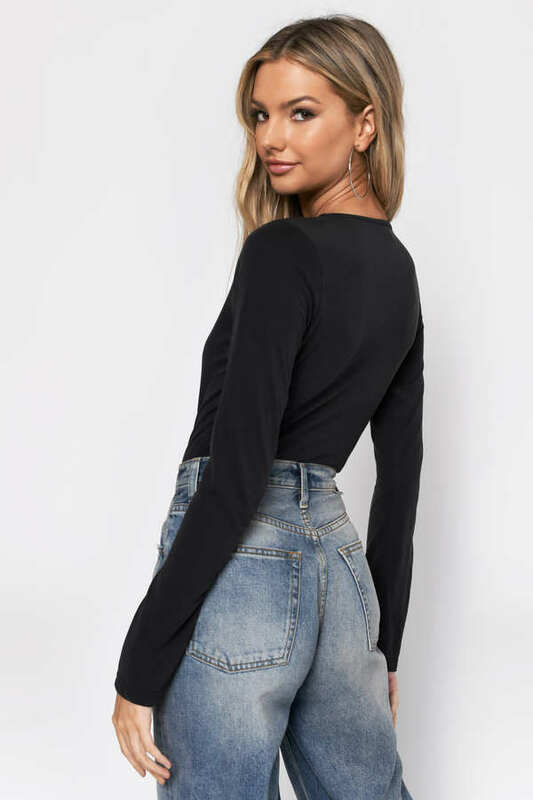 This long sleeve v-neck bodysuit features tight long sleeves, plunging neckline, surplice construction, and soft suede throughout. This evening jumpsuit belongs with a high waisted corduroy skirt and mules at your next date night. Introducing the softest bodysuit you gotta feel to believe, the Emma Black Suede Bodysuit. This long sleeve v-neck bodysuit features tight long sleeves, plunging neckline, surplice construction, and soft suede throughout. This evening jumpsuit belongs with a high waisted corduroy skirt and mules at your next date night. Introducing the softest bodysuit you gotta feel to believe, the Emma Wine Suede Bodysuit. This long sleeve v-neck bodysuit features tight long sleeves, plunging neckline, surplice construction, and soft suede throughout. This evening jumpsuit belongs with a high waisted corduroy skirt and mules at your next date night.